“Biology is the least of what makes someone a mother.” This telling quote from Oprah Winfrey is a great segue into the celebration of Mother’s Day and what it has to offer your family, friends, children and of course, moms. If you are preparing to spend time with Mom this Sunday, enjoy these last minute Mother’s Day Gift Ideas from FirstLight Home Care! Cook her dinner: If you can still smell mom’s cooking from when you were a kid, now is the time to return the favor. Make her one of her favorite dishes and bring the dinner to her, or try and recreate that one meal she made for you whenever you needed a mother’s touch. Write her a letter: If your mom grew up before the digital age, surprise her with a thoughtful, hand-written letter. Even if you plan to visit her on Mother’s Day, sending a letter confessing what she means to you will tug at her heartstrings and give her something tangible to hold on to after you return to your busy life. Give to her favorite cause: What is your mother passionate about and what keeps her up at night? Chances are high that there’s a charity established to help ease her worries and warm her heart, so help her give back by donating to her favorite cause. You can make the gift more special by presenting her with a receipt from your donation to show her how much you care. Digital picture frame: If you have a number of photos of you and your family on a digital camera or your phone, turn them into an interactive digital photo frame to give to mom. You can buy digital frames with large amounts of space and in a variety of shapes and sizes. This will allow mom catch a glimpse of her favorite kids and grandchildren any time – even from far away. A day for her: If your mom is one of the hardest working ladies you know, give her a day to relax and recharge. Stop by her favorite local salon, spa, massage therapist, and restaurant to make appointments for her to enjoy a special day. Giving back to mom doesn’t have to require expensive and flashy gifts – just simple, thoughtful and sentimental tokens of your love and appreciation. 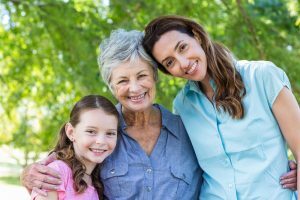 If you have a Mom, grandmother or other family member who you think of as your Mom, who is at a place in their lives where they need assistance, the culture of care at First Light HomeCare can help put your mind at ease. To learn more about the services that FirstLight Home Care can offer your loved ones, please contact us today.